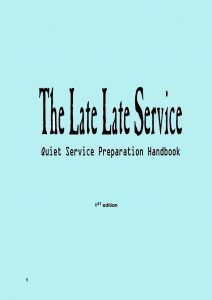 The Late Late Service was an experimental Christian Community in Glasgow. In the 90s I was involved in setting it up with a great bunch of talented folk. It was a committed attempt at reinventing Christian worship for the post-modern era. We had some acclaim for creating visuals, writing music and words and setting them in an original format using references from all aspects of Christian worship over the last 2 millennia. A fine chap called Jim McManus has put up some tunes we recorded on his youtube site and here's one I can share without copyright recrimination as I wrote it and played it 😉 It's a lyric that has followed me through life and turned out to be true. We also created this useful guide to running a service in our style for members - which some people have asked for. Check out the Prophet's Speech from 'Garden to the City' (a kind of immersive liturgical musical that we wrote) written by Doug Gay - on page 20. Awesome. It's also in a booklet we produced called 'Words from the Late Late Service' which as some great guided meditations in it IMHO. Have a look at "The Possibility People" on page 10. The message is timeless! Doug and Jonny Baker & Jenny Brown wrote a very useful book on all this here. Someone started to call this 'Alternative Worship - and now it even has Wikipedia page. So it must have existed.